vertical-align:middle 4 (calculation of the padding). This is a tricky way but works in the same way in the FF2-3 and IE6-7. It totally depends from font-size of the form elements, that must be represented with pixels. The font-size of the form elements is inherited from the UA setting and must be set implicitly. What does it mean? The default UA setting for font-size is 16px, but for the form elements this 16px is the line-height and the font-size is 83.35% (13.3333px) of this value. If you instantiated the font-size for the body: 75% of the UA setting (12px if default is 16px), the font size of the form elements is still 13.3333px. But if you set the UA font-size for example: 18px; the font size of the form elements will be 15.33px, and the line-height will be 18px. Now I want that my <div class="line"> has for example the height: 40px. The font-size of the form elements is: 13px, their height is: 24px. To make the height of the 'div class="line"' 40px I calculate: (40px - 24px) / 2 = 8px. This 8px value I need to use for the padding-top and the padding-bottom of the <div class="line">. 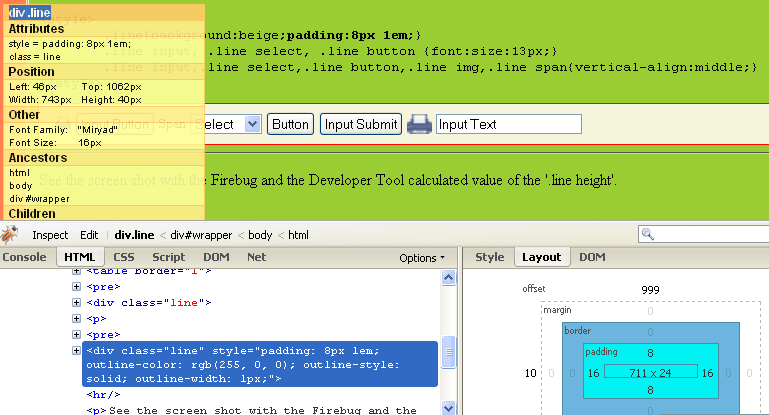 See the screen shot with the Firebug and the Developer Tool calculated value of the '.line height'.